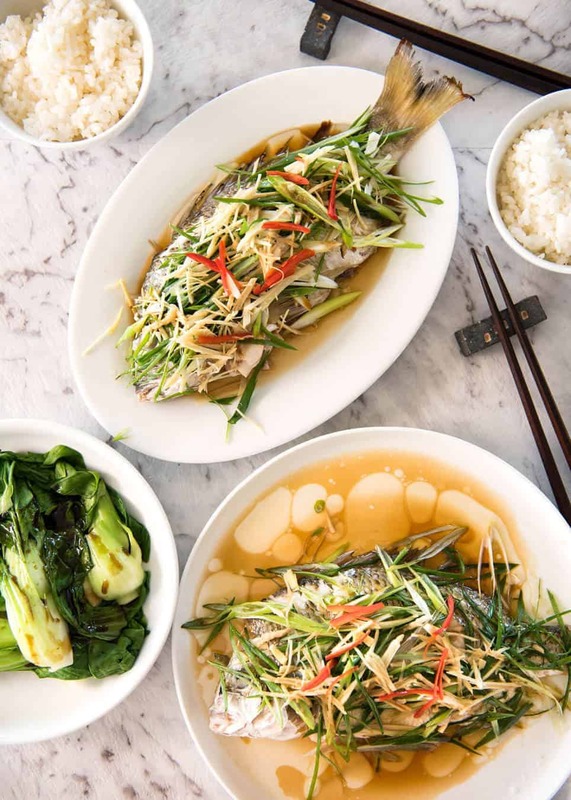 A Chinese fish recipe that is so simple yet so incredibly delicious, you will be blown away. I love the drama of hot oil being over the fish, making the ginger and shallot topping sizzle! 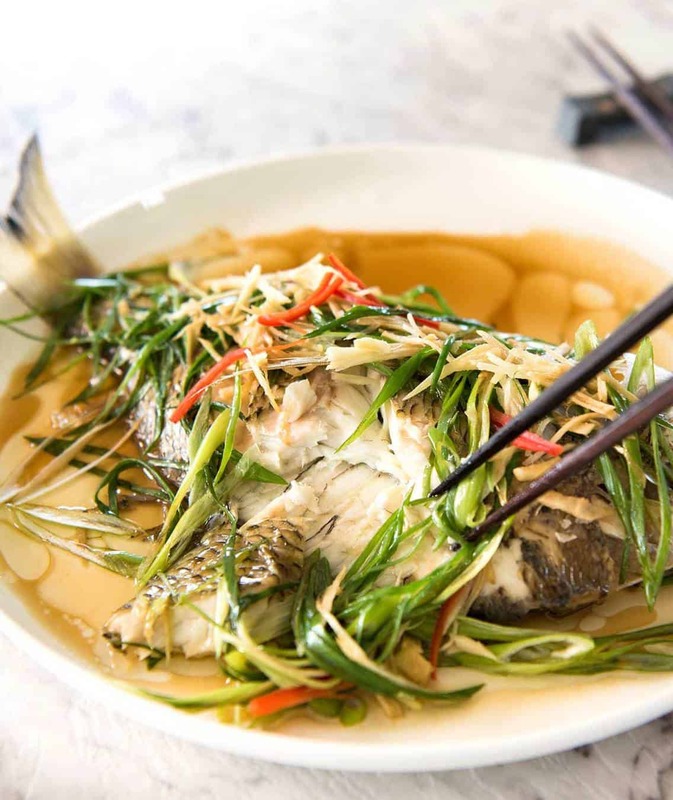 Make this Chinese steamed fish recipe using a steamer OR bake it in foil! I’ve been wanting to share this recipe for ages. It is probably my all time favourite whole fish recipe. I want to say it’s the one I make the most, but because it’s my mother’s recipe and she loves it too, she makes it on request demand request. So therefore, I actually very rarely make it myself. She came around to be my hand model / teach me to make this (properly) and was tapping her nails impatiently as I hurried to take photos. I snapped them in 3 minutes, then we plonked ourselves onto stools and ate these straight off the photo set up I had arranged on my kitchen bench top. And as we got stuck into our respective fish, we were both mumbling “OMG this is so good”. One in a Japanese accent, one in an Aussie accent, both muffled with our mouths full. It never ceases to amaze me how such simple recipes can taste so incredible. 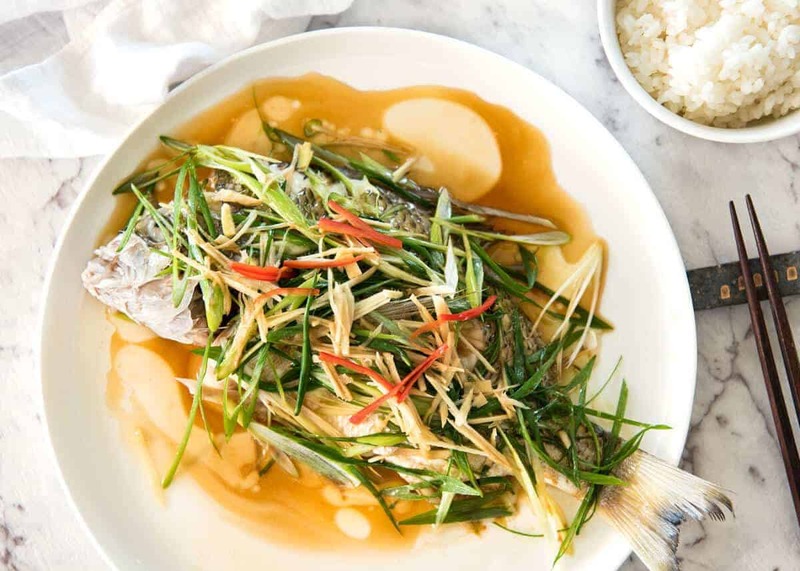 This Chinese Steamed Fish with Ginger and Shallot Sauce is a classic example. 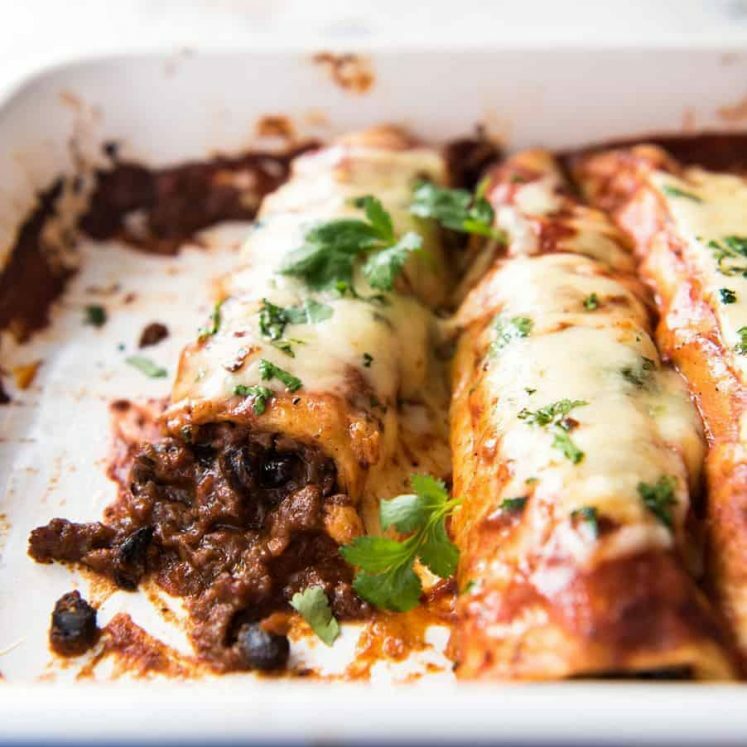 It has so few ingredients and is so fast to make, my mother gets this on the table in 15 minutes. And while it is best made with whole fish (it’s just so much juicier! 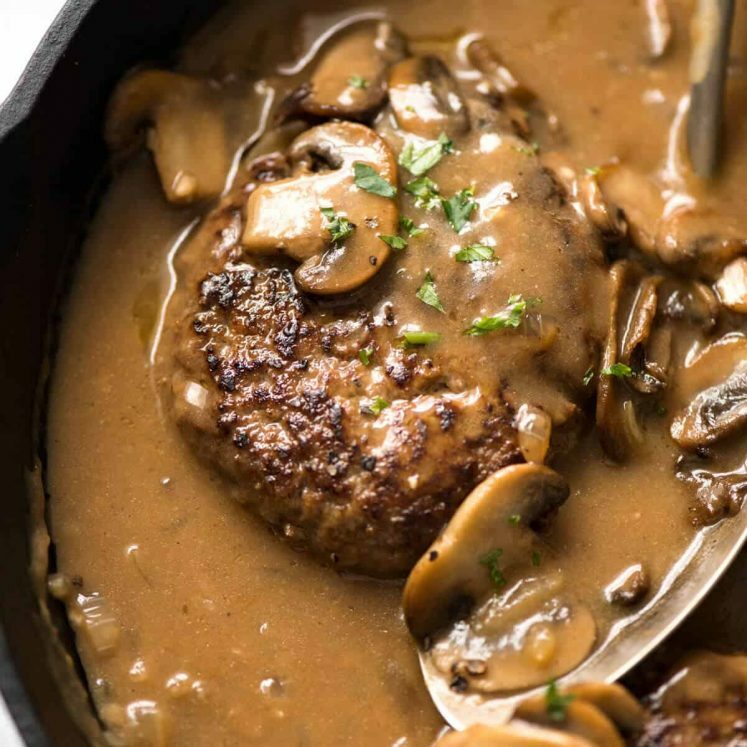 ), it can even be made with fillets. And you don’t need a bamboo steamer! You can steam it in any steamer or you can bake it. More on that below. This is how it goes down. Firstly, cut two slits on each side of the fish. This helps it cook evenly as well as making the sauce penetrate throughout the flesh. For extra flavour, my mother drizzles the fish with a bit of Japanese cooking sake (Chinese cooking wine or dry sherry are alternatives that are just as good). 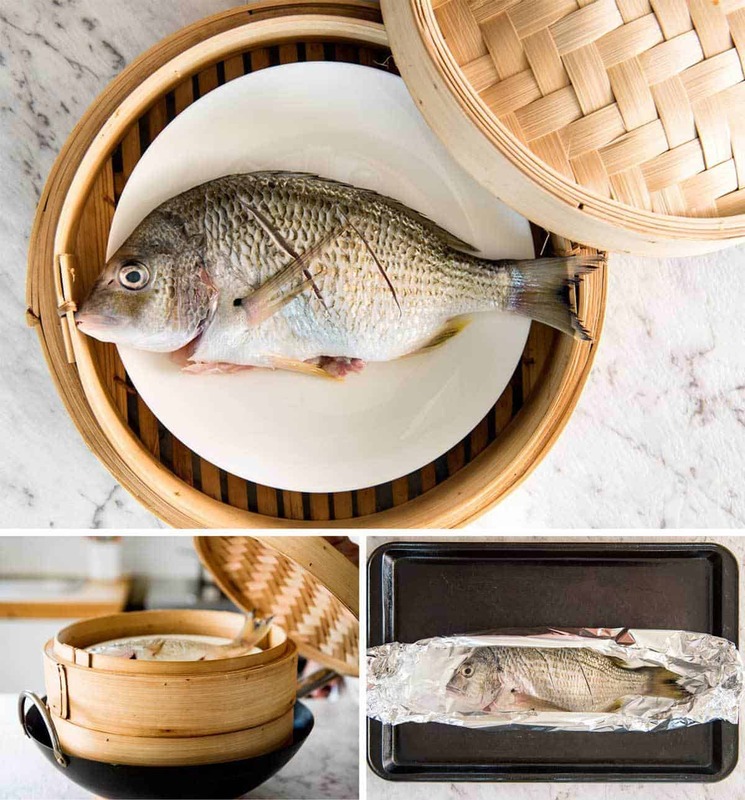 Then if you are using a bamboo steamer, plonk the fish on a plate – makes it much easier to handle – then place the steamer on a wok filled with rapidly simmering water. If cooking 2, as we usually do, then just stack the steamers. Then just steam for 10 minutes. If, like me, you don’t have a bamboo steamer or other steamer large enough to fit a whole fish, the simple solution is to just bake it in foil. The fish is not quite as juicy simply because it doesn’t get the benefit of the moisture from steaming. But the difference is not very noticeable, especially if using a whole fish. For these photos, we steamed one and baked the other so we could compare them and agreed that the difference was small. While the fish is cooking, chop up the ginger and shallots (aka scallions / green onions) and heat up a bit of oil in a small saucepan. Not much is required, just 2 tablespoons per fish. Once the fish is cooked, transfer it to serving plates. 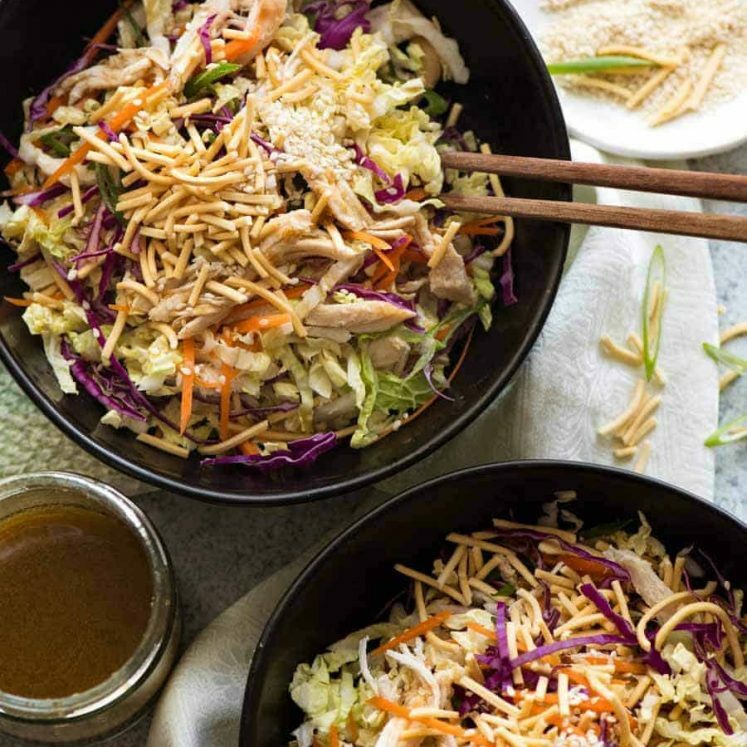 Pile on the ginger and shallots, then sprinkle with salt and drizzle with soy sauce and sesame oil. Now for my favourite part. Even when I was a kid and didn’t actually enjoy this dish that much, I would still dash to the table when my mother poured the hot oil over the top of the fish. It sizzles and bubbles on contact, and partially cooks the ginger and shallots. For a little splash of colour, you could garnish it with some red chillies if you want. Not spicy ones, we used the long red chillies that are very mild. PS Thought a recipe video would be helpful so you’ll find it below the recipe. ❤️ You will observe that the hands are not my Baby Hands. ?? PPS Japanese dining etiquette is to always serve fish with the head pointing to the left. In the photo below I have one (illegally!) place diagonal, just to fit into the photo better! If the fish is being shared, the head should be such that it is pointing left in front of the eldest or most honourable person at the table. In Chinese etiquette, I understand that the fish head should be pointing towards the eldest of most honourable person at the table. 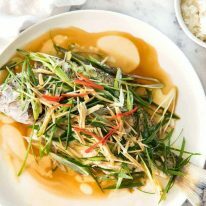 Steamed Chinese Fish with a Ginger and Shallot Sauce! Love the drama as the hot oil is poured over the fresh ginger and shallots, cooking it and creating the gorgeous sauce. This recipe is one of those true treasures that are simple yet taste so incredible, and it's healthy too! The fish can be steamed or baked - refer photos in post or video below recipe. Cut 2 slashes on each side of the fish. Cut through to the bone. Drizzle 1 tbsp of sake onto each fish. Steam fish using method of choice, or bake (see directions below). Meanwhile, heat oil over medium high heat until hot. Transfer fish onto serving plates. Top with shallots and ginger. Sprinkle with salt, drizzle over soy sauce and sesame oil. Pour oil over fish - enjoy the drama as it bubbles! Sprinkle with red chilli if using and serve with rice and steamed Asian Greens. 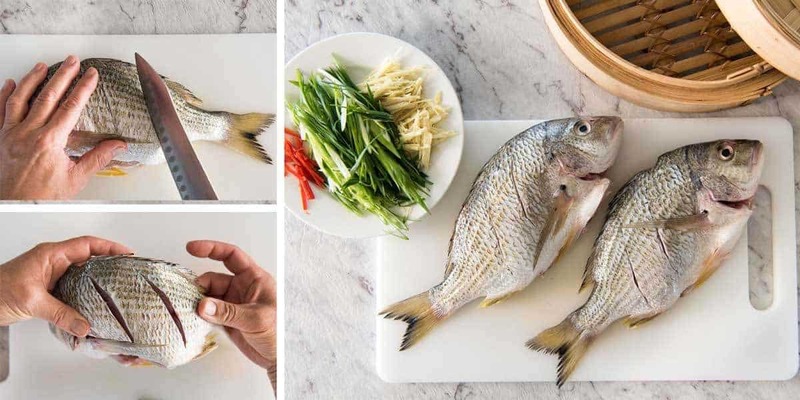 Place fish on a plate and put plate in bamboo steamer. Repeat with other fish. Stack bamboo steamers and put lid on. Fill wok with water, ensuring it doesn't touch the bottom of the steamer. Bring water to boil over high heat, then place bamboo steamer on wok. Steam for 10 minutes. Carefully transfer fish onto serving places. Wrap each fish in foil, place on tray. Bake at 180C/350F for 15 minutes. Open foil and carefully transfer fish onto serving plates. Steamer fitted inside a large pot, or a microwave steamer. 1. 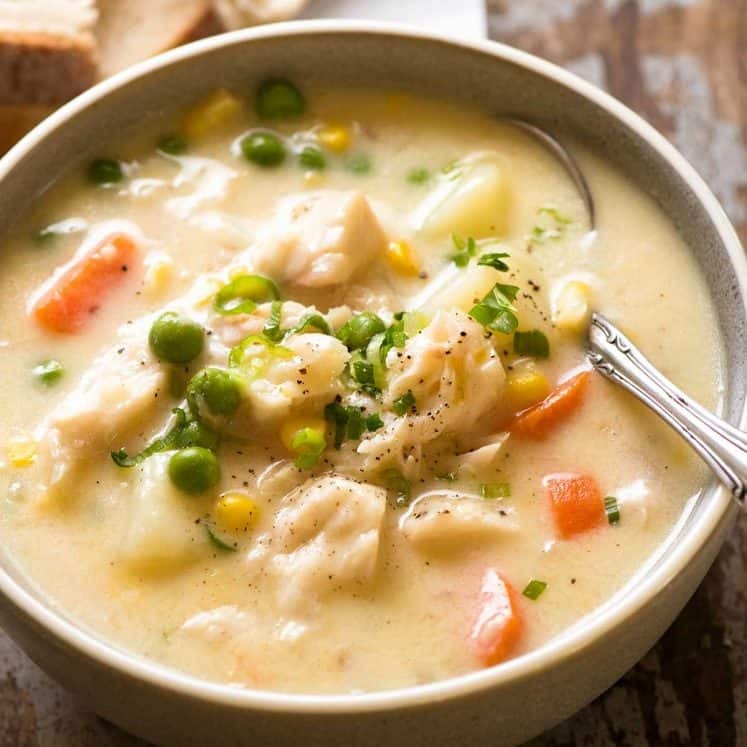 This can be made with any firm white fish that is not too oily. It can also be made with fish fillets, however, whole fish is so much juicier! Sea bream and snapper are ideal - this is what we use the most. 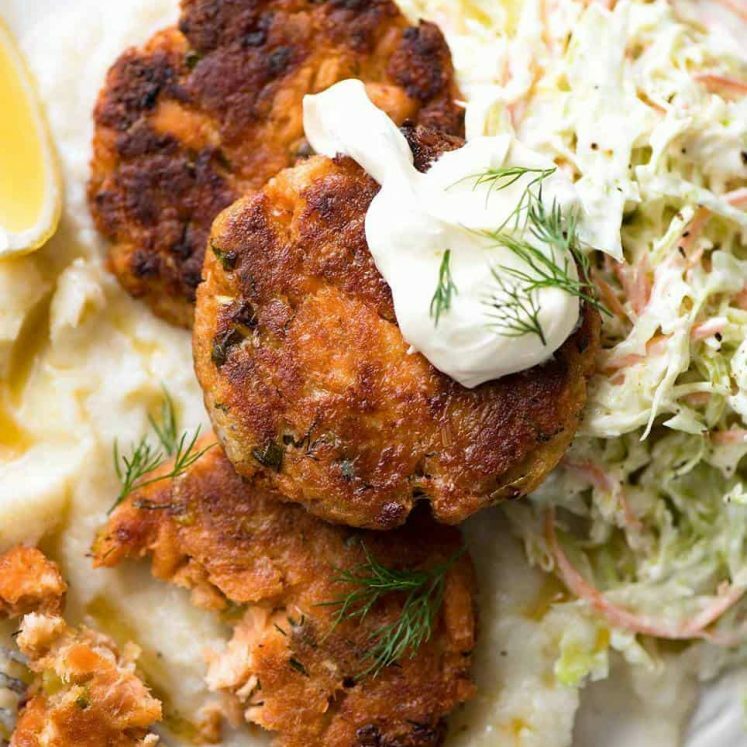 We feel that salmon and trout are too oily for this recipe, however, could be used. 2 x 400g / 13 oz fish is shown in the photos. This yields around 200g / 6.5oz of flesh and is a generous size serving for one person - I was SO FULL when I ate one of these for myself (with rice and steamed pal choi). You can make this with a slightly larger fish - there is enough sauce to make this with one around 450g / 15oz. This will serve 4 people sufficiently if there are sides. 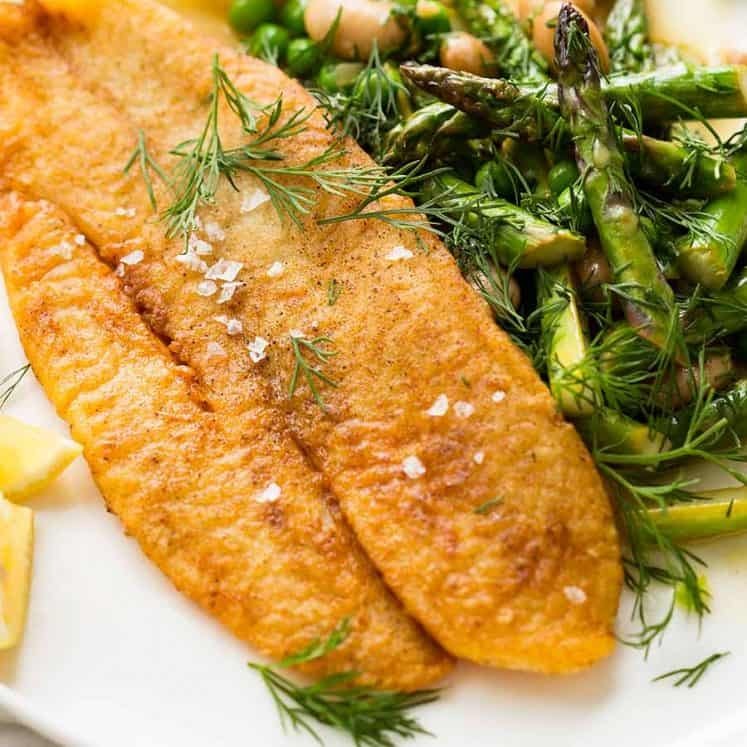 If using fish fillets, use firm white fish around 150 - 180g / 5 - 6 oz each. I purchase my fish gutted, scaled and cleaned. 2. Can substitute with Chinese cooking wine or dry sherry. If you cannot consume alcohol, this can be substituted with chicken broth. 3. All purpose soy sauce is what we use (Kikkoman). However, you can use light soy sauce. Dark soy sauce will not be appropriate - the flavour is too intense. 5. I served this with rice and steamed Pak Choi with Oyster Sauce (I used the sauce from this Restaurant Style Chinese Broccoli with Oyster Sauce). 6. 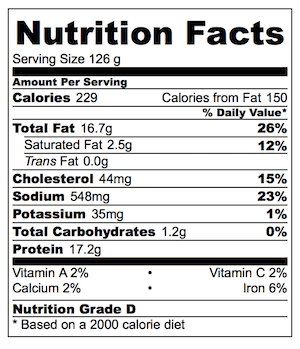 Nutrition assuming 4 servings. This is why he wails mournfully when I tied him outside stores – because it works. Shop assistants are weak too. Amazing! Loved the theatre and it was a great way to serve my brother’s freshly caught snapper. Ripper Rita……yea, the theatrics with the hot oil and sizzle really give this dish a ‘holy moly’ , I just created something really special. Talk about easy as. I didn’t have a whole fish but had some big barra fillets and they worked a treat cooked in the oven. 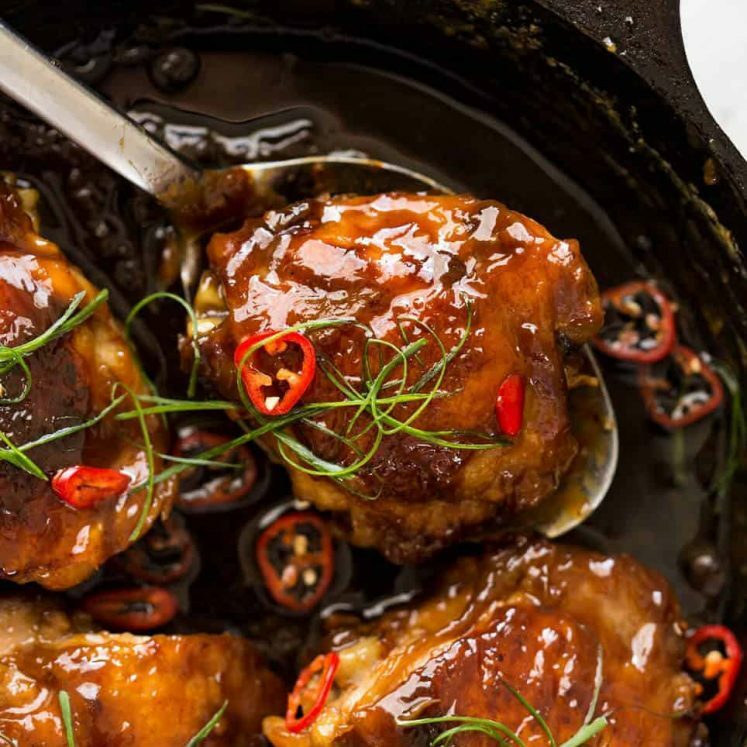 Neither the sauce or ginger don’t overpower the fish, it’s a really really lovely meal. Glad you enjoyed the theatrics of this Barb!!! Hey Nagi I made this last night and it was amazing. Thank you so much. Is there a suggestion you might have to make a prawn with ginger and shallot dish that tastes this good? Thanks Nagi. Either option would fine by me. I thought of flash stir frying some prawns instead and maybe throw in the ginger and shallot. Hi Samantha! That’s the way I’d do it: saute plain prawns over high heat, then proceed with this recipe. The sauce adds seasoning and flavour. YUM! I made it with Bronzino and it’s a keeper…fabulous!!! how does one know if they should eat the skin or not? Is there a general rule at hand? I usually don’t, but have never known either way…. I know exactly what you mean! I love this dish so much too. 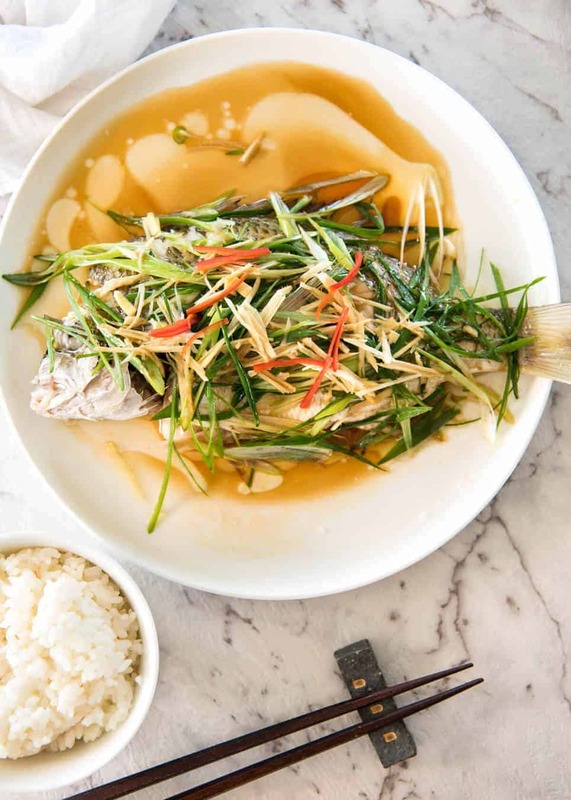 I usually stuff the fish with the scraps from the ginger and scallions and season with salt, peber and vinegar. I steam the fish in a wok by placing something on the bottom, my wok came with a metal thing that elevates the plate from the bottom of the wok, but I have tried with a small ramekin too, and then fill the wok with 2 cm of water. Oooh I love the idea of stuffing the fish! I have to try that! I think my wok came with something like that as well, I must rummage around and find it! Thank YOU! Looks delicious! My PARENTS use to Cook whole fish so having head on Dos Not worri me. 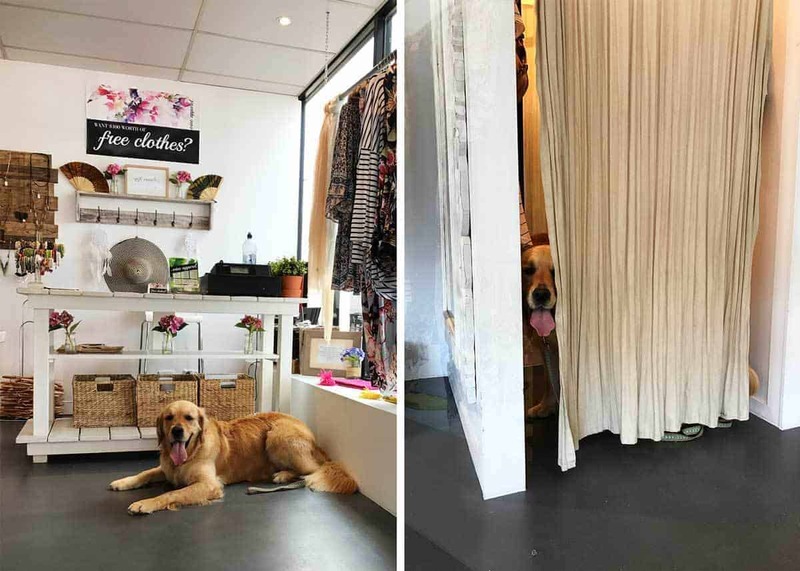 PS Love Dozer PIC behind the Curtains , GORGES !Regards, Vera. 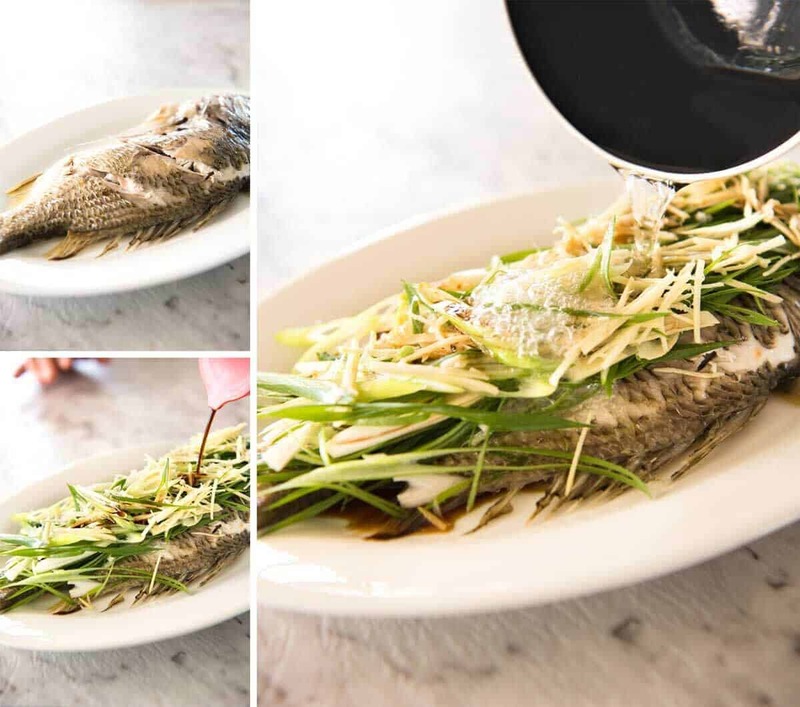 I make steamed whole fish on a regular basis (2 to 3 times per month) and honestly there are few seafood dishes which comair when the taste and simplicity of the prep are concerned. I do one addition step however, putting a piece of green onion and a slice of ginger in each cuts as well as a few pieces of each in the stomach cavity. I also was using Chinese wine but will try the Japanese version next week. I steam on a plate as well but have the fish vertical, dont know if it adds tot he flavour but looks good. I have baked in foil as well but for me the taste does not compare with the steamed and especially the sauce. Hi Nagi! I have not had whole fish in forever! My chances of getting whole fish here is less than zero. However, the lake here is one of the cleanest in the US and we do have a canoe and fishing gear! Love the presentation and the etiquette lessons! 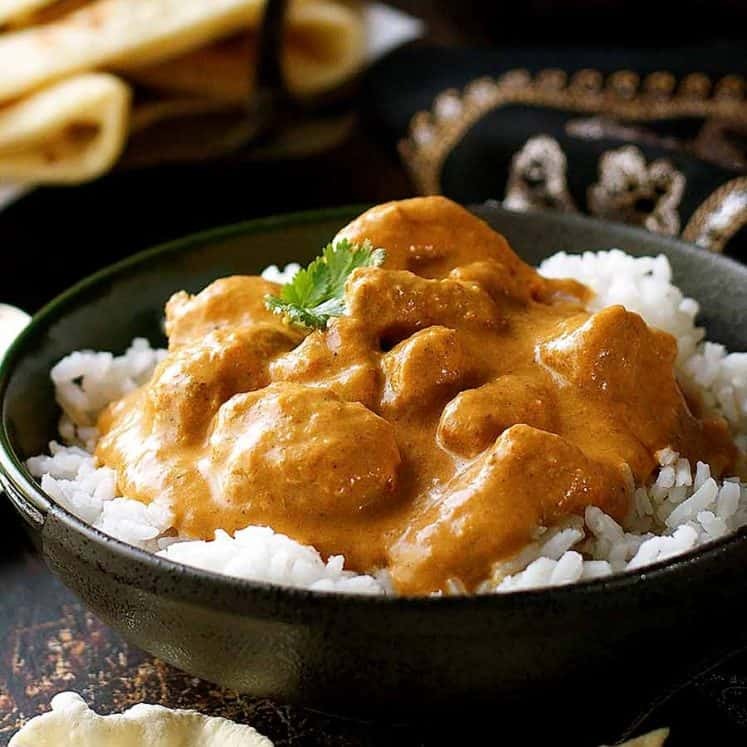 This recipe really brings back memories for me! I used to love watching my dad pour the hot oil over the fish and watch the sizzle! Ohhhhhhhhh!!! I love hearing that Marie!!! Oh my goodness! This is a restaurant-quality recipe. Absolutely love the idea. I got introduced to the amazing merits of cooking and/or eating whole fish in Greece, but must admit I rarely brave giving it a go at home (read never!). Maybe this is one to have a go at when we (eventually!) get to Oz. I have a lovely bamboo steamer there packed away at my mother-in-law’s house! HELEN! How ARE YOU??!! Gosh popping over to SL now to get an update!